A team of licensed bird ringers will be trapping and ringing birds on site. An excellent opportunity to see birds up close and learn the finer details of identifying them. Our volunteer team will be on Horton's Mound all day, watching the birds and catching up with old and new friends. Help empty the moth traps, identify and record the species caught. Guided walk around site. Check & record the contents of the mammal traps with the Surrey Mammal Group. For children aged 1-5 but babies and older siblings are welcome. Come and explore the life of a Caterpillar through craft and play. Come on a nature walk and make a butterfly wand. Feel free to attend the event with your child. The event is run by volunteers who have valid DBS checks. Guided walk around site. Check & record what's under the tins with the Surrey Amphibian & Reptile Group. Guided walk around site. Learn how to identify the birds seen on site. Have a go at pond dipping and identify what you find. Guided walk around site at dusk .Use a bat detector to listen-in on passing bats with the Surrey Bat Group. 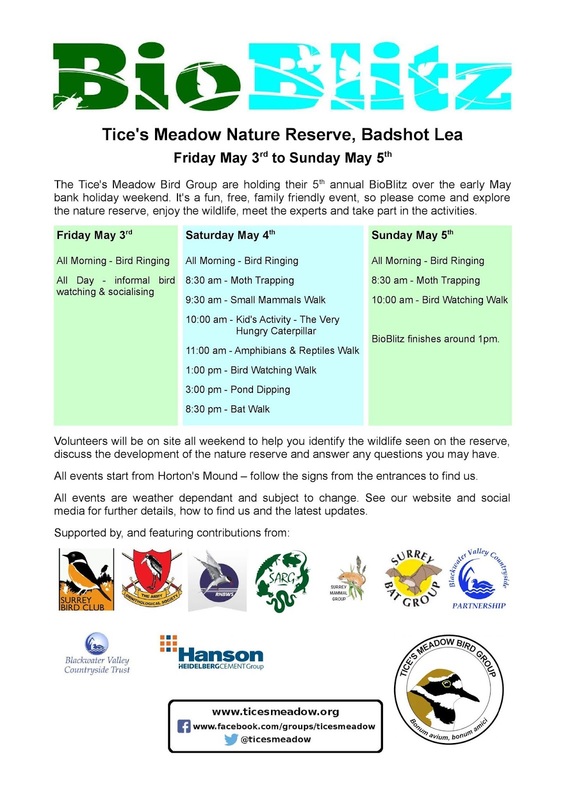 Volunteers will be on site all weekend to help you identify the wildlife seen on site, let you use their optics, discuss the development of the nature reserve and answer any questions you have. All events will start from Horton's Mound – please follow the signs from the entrances to find us. 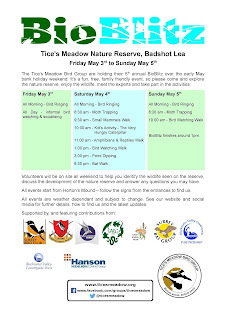 Note: The BioBlitz will finish around 1pm on Sunday May 5th. Note: Schedule subject to the weather. See our social media for the latest updates. See our "how to find us" page for directions to Tice's Meadow. RADAR gates are available for use by wheelchairs and mobility scooters at the Main Entrance and Estate Entrance. The paths may be muddy. 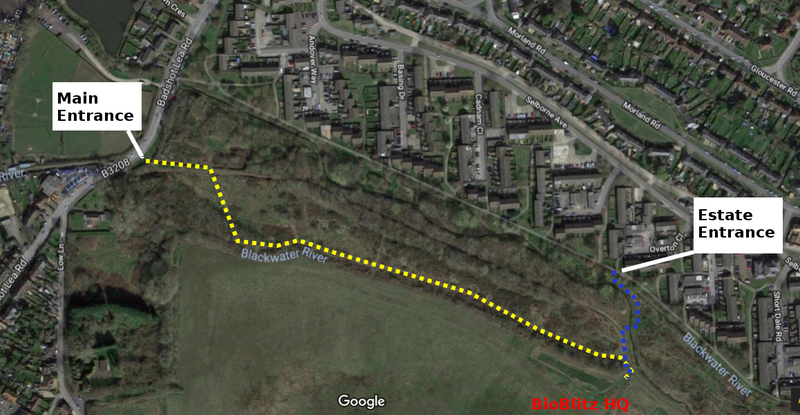 A relatively mud free, circa 200m long, entrance route is available via the Estate Entrance and the new bridge. There is no vehicular access to site. The best places to park are on Badshot Lea Road (GU9 9LS) or Selborne Avenue (GU11 3RQ). Please park responsibly and respect our neighbours. The following organisations will have members present at the BioBlitz and are supporting the event. You will be able to find out more about these organisations and talk to their members throughout the weekend.